Your state and federal tax dollars pay for Medicaid. Medicaid covers one out of five Americans. 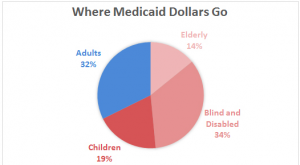 Most Medicaid dollars go to the blind and disabled. The rest is mostly for nursing home care for folks with very limited income or assets – in fact, Medicaid is the major payer for nursing home and similar medical care. 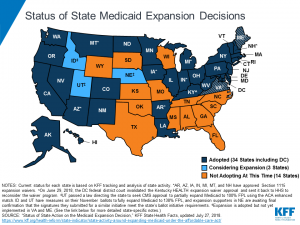 Medicaid expansion (covering people just above the poverty line) is now in place in 34 states (plus D.C.); 2 are implementing, and 3 more are considering expansion. Lastly, my bet is we’ll have some form of Single Payer within the decade – and Medicaid will be the model. What about the Healthcare Leadership Council that I wrote about last week? Won’t they pour money into fighting this also, as they already are with Medicare for All? And what about physicians who don’t take Medicaid now? Will they be forced to take this new model you are predicting will be single payer? re physician participation, I imagine it will be up to the docs and other providers if they want to participate. Most will because they’ll have to if they want to stay in business. Previous Previous post: Where is the work comp insurance industry heading?